The symposium Histories of participation, value and governance, 24 April, 2015, explored present-day notions and discourses of participation, cultural value and the relations between them from a a critical-historical perspective. The keynote was given by Dr Mark O’Neill, Director of Policy & Research, Glasgow Life. Presentations by the UEP team were organised around three key thematic areas: Political discourses of participation and value, Culture and governance, Community, participation and cultural policy. 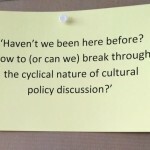 These explored in-depth historical understandings of the development of definitions, assumptions and beliefs around the nature and value of cultural participation as well as their place in contemporary cultural governance and exploitation in local socio-economic development strategies.